We purchased the raw skinless and love them. So easy to roast and taste so much better than store bought. Will be a regular customer for sure. I remember roasting raw peanuts that someone had brought me from "down south", how they were so much fresher than the packaged roasted peanuts in the supermarket. I finally came across an article on various peanut uses, so decided to try some more of my own roasting at home. These peanuts are not disappointing; they are large, flavorful and crunchy. And being already shelled and blanched, they are ready for other uses (such as peanut butter). Beautiful raw peanuts. Great size. A pleasure to snack on after baking. Wonderful product, great service. Outstanding service and couldn't believe the quick delivery. Thank you. Was very pleased when I received the nuts and saw how large they were. I make sugar coated peanuts for the Church Bazaar and as Christmas gifts. The small peanuts don't work very well but was really pleased with Bertie's nuts. Good sized peanuts that taste great. I keep coming back to purchase more. I've been buying two five pound bags each time, but next order I'll step up to the 25 pound size. Bertie Co. Peanuts, always the best! The only peanuts I will ever use for Christmas gifts. I was raised on them and they are still the best available anywhere. I Love them they are great when I sugar them and give as gifts. I work at Charlotte Motor Speedway and a lot of my coworkers will be buy from you guys., Keep up the great job you do., Merry Christmas. The raw blanched peanuts are always the best. I use them to make peanut brittle and I can always count on them being fresh and delivered on time. I ordered a five pound bag of shelled raw peanuts to use in making peanut brittle for holiday gifts. Arrived very promptly and the product was fresh and great quality. This was the first time we ever had raw peanuts. They came in some very neat sacks that were printed with the company name / logo. The appearance of the peanuts is very good and consistent. We have roasted a couple trays of them so far in the oven and they have turned out very well. They are a yummy treat and easy to make. great timing for my sister in erie,pa. got my peanut brittle! excellent product and service! We order the blanched extra large shelled peanuts and they are beautiful. Deep fried them and gave mason jars of them for Christmas presents. Quick delivery too! We have tried another source that were a bit cheaper but prefer Bertie County nuts! Our local stores were unable to find raw peanuts this year for some reason and I panicked that I wouldn't be able to make peanut brittle at Christmastime. Bertie County saved Christmas! Thank goodness for the Internet! Great product, service, and communication! Why doesn't Wegmans Stores know about you?! Owner Response:We'd love to be introduced! For the past 5 years these are the only peanuts I will use. The nuts, the service, and the quality are all exceptional. Product was excellent and customer service was great. Delivery was timely. Will be using products again. Peanuts were wonderful, however, I had to pick out threads of the burlap bag from every cup of peanuts I measured out for my sugared peanuts. Paper or canvas bags might be better. Owner Response:Thanks. We'll take that under advisement, but most folks really like the burlap. Received products quickly and very good quality. You won't find any better raw peanuts for your home-made peanut brittle or parched peanuts. Delicious and beautiful! Our favorite by far. Love the way they roast, so simple to prepare. We get 5 lbs at a time and they keep quite well in the fridge. We are very pleased to have found your website. The blanched peanuts are enjoyed as we make pop corn. They are also delicious roasted in oven with no salt or grease. Our adult sons will be very pleased to have some of our supply! I enjoy receiving them in a timely fashion. Other companies charge postage almost comparable to the price the peanuts. I like that you don't. Love the quality of the nuts, the recipes included and the speed with which my order was filled! I grew up in Windsor and I am always delighted to get my hands on the very best. Amen! We love these and my family in North Carolina loves them. I bought these for a gift!!! My daddy was very happy! The peanuts were delivered very quickly, packed to ensure there was no breakage and tasted awesome! There were recipes enclosed with the nuts that we can't wait to try. Delicious, nutritious& filling. That just about says it all. 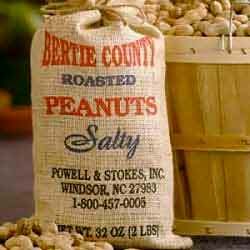 I tried many different peanut companies to get peanuts before, until I found Bertie County Peanuts. Now I have got peanuts from Bertie County Peanuts for years, because the quality of peanuts is the best and the service is the best. Thank you, Bertie County Peanuts. The peanuts appear to be very good - I bought them for squirrels. I really like the packaging - 5 lb. bags. The delivery was very quick. I'll definitely order more from this company! Great peanuts...large, fresh and delicious roasted with p'nut oil in a pan. You should sell good peanut oil...it's becoming harder to find. Owner Response:You are correct. You did order Raw Shelled Redskin Peanuts - shelled peanuts are peanuts that are out of the shell. Evidently you wanted Raw In Shell Peanuts, so we'll see what we can do to correct that problem. Wonderful taste once pan sauteed in peanut oil...wish you sold peanut oil. We love them better than any canned peanut product on the market!! Excellent transaction. My order arrived very quickly and was packaged very good. Ordered large blanched raw peanuts and received peanuts that were not what I would call large. I can get larger at the local health food store. 1st time experiment. trial and error different recipes. much better than store purchase. As customary, the service and quality of your products are exceptional. The prices are very reasonable and it is a pleasure to be a customer. Received product quickly and they were fresh. Enjoying my weekly portion of fresh roasted peanuts. Trying to make them last longer, hope I succeed. Many thanks! Great product with speedy delivery! MADE PEANUT BRITTLE WITHIN HOURS OF RECEIVING MY PEANUTS THEY WERE SO BIG, FRESH, AND DELICIOUS. BEST BRITTLE I EVER MADE, AND I MAKE ALOT OF GOOD PEANUT BRITTLE. ALSO, ORDERED 20LBS. ON TUESDAY BEFORE THANKSGIVING AND THEY ARRIVED ON FRIDAY AFTER THANKSGIVING.... PROMPT? YEP THEY SURE ARE!!!!! I love the peanuts, but hate the petroleum smell of the burlap bags they come in. Can you consider packing in cotton bags instead. Bet it would be cheaper to print and to close them. Rating 3 on pkg, 5 on peanuts. I grew up in Murfreesboro NC and loved them then and still love them today. Exactly what I remembered as a boy. I make about 25 pounds of Homemade peanut brittle as Christmas gifts each year and these peanuts are perfect for it. I switch each year between 'blanched' to 'redskin'. Love them and will continue to purchase. Price and quality is supurb. I ordered two five pound bags of shelled raw peanuts and deep fried for the holiday gifts to my co-workers. Arrived very promptly and the product was fresh and great quality. This vendor was great to do business with. The peanuts are wonderful and my peanut brittle was fabulous thanks to the peanuts. I got them quickly and could not wait to roast my peanuts I received and when I did it was like old times. They really taste good hot. I love them. We have been eating these for years! I am a peanut lover now. Easy ordering from a very user friendly website. Raw peanuts were very fresh. After roasting, nothing on store shelves compares to the taste of these peanuts. The bag said "recipes inside",but I could not find them. You should include a recipe page on your website. Owner Response:Sorry about that. We'll get you one in the mail. And, we do have some recipes on our website - they are located on the individual product pages. Peanuts were fantastic. Fresh large and delivery was fast. Use them as gifts. Thanks to a great company and product. Okay but not as good as Jimbo's Jumbos. Life is good with raw blanched peanuts in the freezer to parch at any time for a wonderful snack. These peanuts are excellent quality and delicious taste. very good jumbo red skin peanuts!!! I have bought the raw shelled peanuts for my wife for many years, and with one exception, they have always been fresh and good. Bertie County replaced the one bag with no questions asked. Quick shipping! Outstanding peanuts!!! Love no shells too.Very flavorful. Excellent peanuts, good price, great service... what more could you ask? Thanks, Bertie County! This is the second time I've ordered peanuts from this company. They are prompt on delivery and the peanuts are great. Each year I use them to make peanut brittle and have never been disappointed. I will continue to order from them. This is the 4th year I've ordered my peanuts from you and have never been disappointed. They come packaged in a burlap sack and always fresh. I have recommended your company to several friends who are amazed at the size of your peanuts and how fresh tasting they are. Love these peanuts and the excellent service on orders. Thanks so much!! This is a great product and shipping is right on time. My Mother started making Hot Nuts over 20 years ago and I continue, as a Christmas gift for over 40 Elk Lodge members. The only comment I get is: Don't Forget Me! Second year using Bertie Co. Peanuts for my annual Peanut Brittle. First year was great expect nothing less this year. Thanks for the great products. I love NC peanuts! These raw peanuts are delicious! Dec 14, 2015 | By Ken S.
The highest compliment you can give is to come back. The cotton bag containing this order is as brilliant as the taste of its contents. My family has enjoyed the raw peanuts for years. We also give them to friends for Christmas. Love my roasted Bertie peanuts! I always have some on hand! The blanched raw peanuts are so nice-we deep fry them and give them as very well-received gifts. I recently ordered 4 five lb. bags of extra large shelled peanuts. They arrived even sooner than I had expected and were superb quality. I use them to make the sugar coated peanut recipe which is always included in each bag. It is a wonderful recipe which I have made for over 20 years to be given for gifts and always served at my parties. They are fabulous !! Love these peanuts when they come out of the oven, warm!!! Like experimenting with different spices and seasoning. I buy the raw red skin shelled peanuts for my husband. They arrive very quickly, and very fresh! I will be buying again! Absolutely wonderful peanuts. I will never buy peanuts from somewhere else ever again. The peanuts are huge, and completely yummy. Highly recommended. The only peanut you will ever want. Peanuts fron eastern North Carolina make me still feel like a Tarheel even though I live in Arizona. Very fast shipping. My order of raw shelled were the best I ever had! I was awesome!!! The size was extra large and love it!!! Aug 29, 2016 | By BEVERLY S.
EXCELLENT AND WHAT A TIME SAVER. NICE AND BIG SIZE..
Fabulous! Fresh, consistently sized, perfectly peeled. These peanuts are far superior to anything we can find locally. The only thing that would help would be to be able to buy a smaller quantity than the 5 lb. bag. Best possible quality, reasonable prices, fast delivery. 5 stars and I will order from them again. My order shipped the next day and arrived the following day. I made fried garlic peanuts and boiled peanuts and both were the best I have had, and were a big hit with my friends and family. We are on a diet and we purchase the blanched skinless peanuts that we can bake and eat as a supplement to our diet. They are great fresh baked! I have ordere from this company 3 times with excellent results. The product is fresh and delivery is quick. I wholeheartedly recommend them. Your Extra Large Redskin Peanuts are phenomenal. I've been roasting my own peanuts with these tasty redskins and they are delicious. Keep up the great work. Really liked the large peanuts. Will be back for more. I've been buying my raw skinless peanuts for a few years through Bertie for making brittle and they come quick, are fresh, and a great price. This is my third order this year! Love the raw blanched skinless peanuts! Fast delivery too. I bought these for my boss (although I am also enjoying them). Was not sure if he liked raw peanuts, but they have been a hit! We give for Christmas. If we ever stopped there would be riots. The best peanuts to be found anywhere. Made peanut brittle with these peanuts. It was one of the best batches. I had to make a second batch folks enjoyed the flavor of rhe brittle. The peanuts make great brittle. I have been using your product for years to make Micowave peanut brittle, I get raves every year, thanks. I had entered an order with wrong quantity, noticing it when the order popped up in the right top of your webpage. Look at the top of this page: it covered up "view your cart" and the phone number. Changing the order requires access to the cart, but who would know that.. Always good! large nuts with good quality! Might I suggest putting raw peanuts in a paper sack prior to burlap sack. Most other companies do this. I have to pick out small threads of burlap prior to using your product. Owner Response:Good idea. We'll look into it. Thanks. I grew up having my great great grandmother from Hertford County cooking these for the family. We all loved them and missed them once she was gone. I have now for the past 2 yrs purchased these peanuts for Christmas gifts to carry out the family tradition. I love them. They are fresh and hot straight from the oven and you can purchase a larger package because they freeze well up to a period of time. Awesome healthy snack. We all need our protein and it doesn't always have to be by purchasing meats. 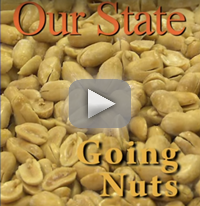 Stay healthy for a healthy lifestyle thanks to Bertie County Peanuts. You guys are Awesome! Excellent service of an excellent product! Had exactly what I needed and product was great and shipped promptly. Purchased as a Christmas gift for my father-in-law. He roasted them and told me they were excellent! I love the raw peanuts freshly roasted. I have loved peanuts since I was a child. The redskin raw peanuts are the best I've seen. The are large and the taste is super. Bought the 5# bag of raw shelled peanuts. So awesome, I bought a second bag! Peanut brittle is yummy with these delicious nuts. Blistered, roasted, raw - my husband loves 'Emmaline! These are the best!! We bake in oven for 15 min, lightly salt and they are a great snack for days! I also order your raw redskins and I roast them to perfection in my kitchen. My friends and customers simply love them!! If what I received were extra large, as the bag indicated,how small are large and regular? Bertie's offers the best peanuts, and the best service! The peanut are very fresh and was delivered on time as stated. They are totally amazing! I fry them and give some of them away as a gift for friends and relatives and they love them and so do I! Thumbs up for Bertie County PNUTS!! This was my 2nd order of peanuts. When these are eaten I will buy more. They shipped the wrong nuts but made good right away! Nuts are perfect for recipes! Great Peanuts, I would recommend them to anyone. Was raised in the same location as these peanuts. Been eating them for more than 60 years. None better, anywhere! The price was great, ordering was easy Andy the peanuts are super! The order is always sent out promptly and arrived swiftly. However, I dearly would like to find a way to get free shipping. Excellent! Large size peanuts which are always perfect and fresh. Fast delivery! Love ordering from here. All their peanuts are the best! The peanuts are delicious and the ordering process is fast and easy! Was expecting a menu with roasting suggestions. Did not receive one. Otherwise excellent. I received my order of raw redskin peanuts to make peanut brittle for gifts. They are of excellent quality, consistent in size and really work up well! This company is my "Go To" for prime peanuts! This was my first time ordering from Bertie County Peanuts, but it will not be the last. I ordered the raw shelled peanuts and was extremely pleased with the product and the service. Thank you!!! Large redskin peanuts are very hard to find, they seem to get smaller each year. These were very large and very tasty. These are the best. We like to roast them for a snack. The best peanuts I've ever had!!!!!!!!!! These are some of the best peanuts I've ever tasted as because I love them and have been eating them since I was a child. We have been ordering off and on from Bertie for many years. We love the peanuts and the fast shipping. We we run low on our current stock we will order again and again. So glad to be able to find the same peanuts that I grew up eating in NC. Great find. Love them. Excellent packing and prompt shipment. Thanks! My mother lives in NY and loves the peanuts. I ordered them on Thursday and she had them by Saturday! Fresh and delicious! I cooked your blanched, shelled peanuts in olive oil, seasoned with kosher salt and they were a big hit with my family and friends! We have been buying your raw shelled peanuts(extra large reds) for many years now. They've never failed us and, roasted in a pan just with a little butter and salt, they are a tremendous hit with all my family and all our guests. Thank you Bertie's!! The BEST peanuts EVER!!! We love them & we share with our friends & neighbors. We buy the raw shelled peanuts in the 5# bags. We have not had a bad batch yet. Love them roasted. I started buying these years ago when I was in North Carolina. Now in Missouri, I can't stay away and mail order them. Good quality, great taste, I'll stick with them forever. fine quality nuts make me the star! I use my blanched raw peanuts to make peanut brittle which I give to family and friends for Christmas. They are always the best quality nuts and they make into melt in your mouth peanut brittle. No comparison to grocery store raw peanuts. Bertie's are larger, fresher, and taste so much better! I ordered 20# of raw shelled peanuts to make peanut brittle for a church craft show. I am very pleased with the quality of the peanuts. Also, the customer service was excellent! The order even came a day earlier than expected! I love the larger peanuts in my brittle. It turned out perfect! I ordered several two pound bags of raw bits for roasting, baking, etc. Great! Included recipes. Great product and arrived very quick! Great Nuts for a fair price and quick delivery! 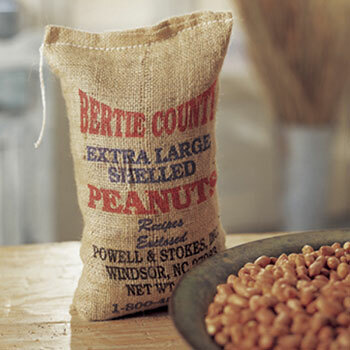 Love Bertie's Skinned Raw Peanuts -- Tastes like HOME FOR THE HOLIDAYS! Thank you for selling raw peanuts -- very hard to find them anywhere anymore. I have purchasing these peanuts for several years now which I use to make my 'Home Made Peanut Brittle'. I make about 18 2 pound batches every year for Christmas as gifts for family & friends. I used to purchase the peanuts from the local grocery store, if I didn't start getting them early, they were out when I needed them. I found these peanuts online and will never go back to the store peanuts. These are larger, fresher and just plain better. Love them and so does everyone who gets the peanut brittle. Have bought these as Christmas gifts for friends for years.They look forward to receiving them.Always ships on time and great quality peanuts. The raw peanuts are large and of excellent quality. They taste great sprinkled with a little water and salt and put in the microwave a few minutes. My husband and I have ordered the 5 lb. bags multiple times and plan to continue. The peanuts are very good. Too bad uoubovercharge for the shipping. At the high rate (only option) I paid I expected to receive them much sooner. Your neighbors also offer very good peanuts for lower shipping charges. I've ordered the raw peanuts for over 20 years. They are the biggest and the best tasting. Nothing like a fresh roasted peanut. Just 30 to 45 minutes at 300 or 350 and they're ready. Delicious!!! Best raw peanuts I've ever bought. Convenient way to get eastern NC peanuts. 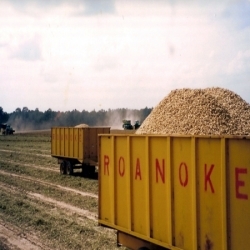 Being that I grew up in Bertie County, and know the area is known for harvesting premium peanuts-I'm probably very partial! However, the products as well as customer service are superb! It's very hard to fine quality peanuts in Atlanta where I presently live, so I order the raw shelled peanuts and roast for healthy snacking! Their products are consistent and delicious! Can't say enough good things about the quality of the product and the quick delivery time. I'll order again!